Macedonia is a country at the heart of the Balkans, with rich archeology, art and culture. Its terrain is characterized with massive mountains, intersected with wide valleys and lowlands. The capital is Skopje. The country has an area of 25,713 km². It is bounded on the north by Serbia, on the east by Bulgaria, on the south by Greece and on the west by Albania. Its terrain is punctuated by deep valleys and rugged mountains and hills. Many of the mountain ranges rise to heights of 2,100 to 2,700 m. The Rhodope Mountains dominate the republic’s eastern half. Mount Korab, on the Albanian border, is the highest point in the republic at 2,764 m. The Babuna Mountains are in the center of the country. They separate the fertile Bitola Plain in the south from the Skopje Plain in the north and the fertile steppe of the southeast. 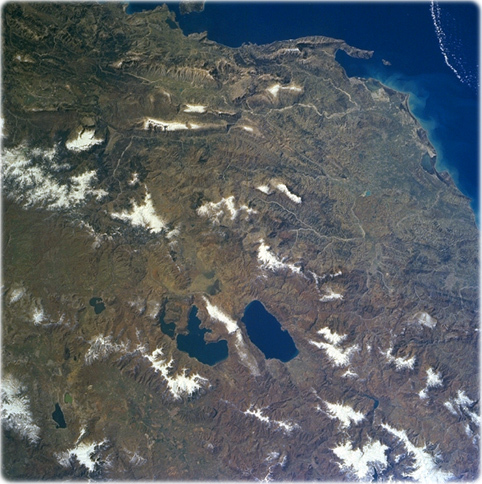 Lakes Ohrid & Prespa, Albania/Macedonia Winter/Spring 1997 (NASA). Located just below the center of this image, Lake Ohrid is the deepest lake in the Balkans. Just to the left of Lake Ohrid is Lake Prespa, the highest lake in the Balkans. The smaller Mikri Prespa is just to the left (east) of Lake Prespa. Lake Ohrid is 40 km long and covers and area of 340 km². Lake Prespa is 23 km long and approximately 13 km wide and covers an area of 290 km². Lake Prespa drains into Lake Ohrid through a series of underground channels. The terrain around the lakes is hilly but not overly steep. The region around the lakes supports a larger population than other inland areas in Albania, northern Greece, and Macedonia. Most of Albania is visible in this view (right of the lakes). The terrain, except for a narrow coastal plain, is mountainous and often inaccessible. Soils are of a poor quality except in the intermontaine river valleys, along Lakes Orhid and Prespa. The Vlores Gulf and Adriatic Sea are visible in the top right corner of the image. 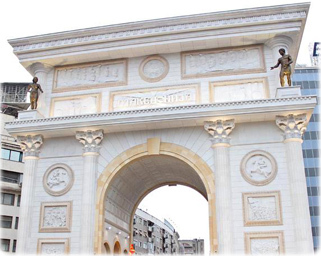 Porta Macedonia, located on Pella Square in Skopje.